NEWPORT BEACH, Ca. – The City of Newport Beach (City) will be testing its outdoor warning siren system on Friday, May 4, 2018 at 12 p.m. This test of the 10-year-old system will be performed at a higher decibel level compared to the regular monthly testing. The systems three sirens, located at the West Jetty View Park, Marina Park and West Newport Park, are regularly tested the first Friday of each month at a low decibel level. The lower setting could only be heard by those who were immediately adjacent to the sirens. During the May 2018 test, the system will be set at a higher decibel level to ensure the sound is traveling to the designated coverage areas, as depicted in the below image. The system’s sound is similar to an air warning siren. City staff will be out in the community during the testing to record the results of the higher setting. The outdoor emergency warning system is in place to provide immediate notification during any type of disaster or hazard when immediate action from the public is necessary. If the sirens are heard in the community and it is not the first Friday of the month, community members should tune their radio to station 107.9 KWVE and await further instructions. On May 4 at noon, the City of Huntington Beach and the City of Laguna Beach will also be testing their outdoor warning systems, which are separate from Newport Beach’s system. A disaster or emergency situation can occur at any time. Community members are encouraged take action now to be prepared before a disaster strikes. 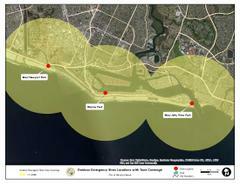 The City has resources available online at newportbeachca.gov/disasterpreparedness. For inquiries about the outdoor warning system or disaster preparedness, please contact the City’s Disaster Services Coordinator Katie Eing at keing@nbpd.org.